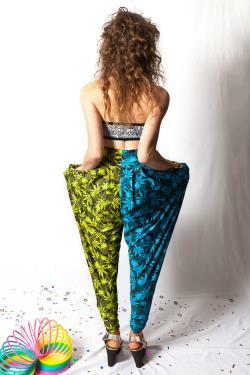 Double the pleasure with these rad harem pants made with contrasting weed prints. Includes deep side seam pockets, 2 1/2 fold over waistband, and flattering pleats in the front and back giving a more volumous look. Made in 4-way stretchdex. Machine wash warm with like colors.